Barn Swallow “A unique blend of old and new!” Featuring three floors of antiques, art, vintage clothing, jewelry and gifts. “We’re more than just a garden center!” Enjoy a visit to our Nature Exhibit or spend the day shopping at the Barn Swallow; antique and gift shop, the Rock Shop, or for a large selection of nursery stock, perennials and garden gifts and decor at the garden center itself. Come explore the new expanded show room! Stocked with rough and polished petoskey stones, fossils & agates. Stone jewelry, lamps & more! Trade your iPad for the splash pad. Your laptop for the lap pool. And emails for exhales. Because memories aren’t made sitting behind a screen. They’re made in the waterpark, taking a trip down the apline slide, relaxing by the campfire, and on a long hike. It’s all happening this summer, at Crystal Mountain. "ELBERTA JUST MAY BE THE SWEETEST UP NORTH TOWN. BEST MEMORIES AT THE LITTLE YELLOW HOUSE ON LINCOLN AVENUE." 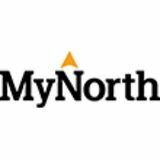 "I GO SOUTH FROM TC TO GET MY 'UPNORTH' FIX." So many things to do in this vast and beautiful region, so little time. Start here! Act like a kid on Crystal Mountain’s Crystal Coast Alpine Slide. Wave to the car ferry the SS Badger as she docks in downtown Ludington. Get the bird’s-eye-view tour of the Manistee shoreline on an Orchard Beach Aviation Tour. Get your sculpture-culture on at the Michigan Legacy Art Park. Editorial & Advertising Offices 125 Park Street, Suite 155, Traverse City, MI 49684 Phone: 231.941.8174 Fax: 231.941.8391 E-mail: info@mynorth.com ©2019 Prism Publications, Inc.
Catch a flick at a vintage movie theater—the Garden in Frankfort; the Vogue in Manistee. Immerse yourself in the Kisstory Tour, commemorating the rock band’s 1975 visit to Cadillac High School. Explore the stunning Arcadia Dunes. Spend a day soaking up the sun and surf at Ludington State Park. RETHINK Manistee County! You will be amazed at the changes! Rent and enjoy the charming Lighthouse Assistant Keeper’s apartment with breathtaking views of Lake Michigan, Sleeping Bear Dunes, and the Manitou Islands. This historic renovated apartment is just steps away from the beach and spectacular sunsets. 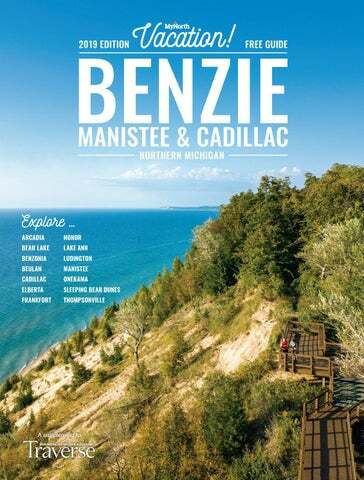 EVENTS Make a date with Benzie, Manistee & Cadillac to get out and about this summer. The 71,000 glorious acres of Sleeping Bear Dunes National Lakeshore spread over Leelanau and Benzie counties. In the Benzie area of the park you’ll find secluded beaches, quiet hikes, river mouths and much more. Start at the park's visitor center in Empire (just over the Leelanau County line) and work your way south on M22 to explore these 6 secret and sacred spots. Otter Creek emerges from its tree-lined banks into the wide-open blue of Lake Michigan at Esch Road Beach. Yep, that spells beach day. Motors are allowed on Loon Lake, south of where the highway crosses Platte River. Also find a pleasant picnic area. Picture near-empty beaches and dramatic beauty at Peterson Road Beach. Platte Point Beach is the Lake Michigan river-mouth of Platte River. If you can’t imagine how stunning that is, better see it. Take a serene paddle around small, shallow Round Lake, the southernmost lake in the park where motors are prohibited. The Old Indian Trail follows two loops, each about 2.5 miles long, to a magnificent Lake Michigan beach. Several outfitters, including Riverside Canoe Trips, The Honor Trading Post, All About Water and Sleeping Bear Surf and Kayak can rent, drop and pick up kayaks for you. The salmon fishing on Platte Bay is legendary. Frankfort is filled with skilled charter captains who help you bring home big beauties. Let the sounds of the bay lull you to sleep at the Platte River Campground. More sandy shores for unforgettable beach days. SIP LIKE A LOCAL Gratefully, classic Up North taverns still abound in this region. But just as great: know that a hip, one-of-a-kind microbrew, micro distillery, local wine and local hard cider scene is growing up right alongside those good ol’ boys. When brewer Brian Confer decided to start a microbrewery in beautiful but sleepy Frankfort it seemed to some people like, well, a stretch. But his Stormcloud Brewing Company has put Frankfort on the cool map. You could say the same for Jamesport and Ludington Bay Brewing Companies in Ludington, North Channel in Manistee and Cadillac’s Clam Lake Beer Co. Each establishment has is own beer profile, but they share conviviality, great live music and an eclectic mix of entertainment from bingo and trivia to Stormcloud’s curling court. Around the same time Confer was making beer magic, brewer Matt Therrien had a similar idea—in once equally sleepy Lake Ann. Nowadays, good luck trying to find a seat at this hopping spot where the brew is noteworthy, the live music is fab and the pizza from the restaurant next door (that you can bring in and eat with your brew) just plain rounds out the experience. If Confer and Therrien were upstarts, Richard and Sarah Anderson and Heidi Bolger and her husband David Wallace, were downright renegades for their dream of a farm-to-flask distillery on a 120-acre former wheat farm surrounded by forest. The couples purchased the farm as a retirement getaway but changed course after a visit to a farm distillery on the Scottish Isle of Islay. What they began in 2013 has been nothing short of a revolution in the Benzie hinterlands. Besides handcrafted spirits from grains and other ingredients grown on the farm and locally, Iron Fish Distillery (named for the steelhead in the nearby Betsie River) has become a notable tourist destination. Produce a handcrafted local spirit and then create an oasis out in the country where folks can come and sip, enjoy the scenery and kick back and listen to live music. As it has worked for grain alcohol, it has worked for Douglas Valley Winery in Manistee (sip in the renovated bunkhouse for passengers on the Manistee & North Eastern Railroad) with wine and hard cider. And over in Chief, a postage stamp-sized town in Bear Lake Township, Northern Natural Cider House and Winery boasts five varieties of USDA certified organic cider. One of them, Northern Star, is a World Cider Competition Gold Medal winner. Enjoy all of this in Northern Natural’s relaxed, hip tasting room. What the others have done with whiskey and wine, St. Ambrose Cellars did with mead—the ancient alcoholic beverage made from fermented honey. Mead was a logical step for the founders of Sleeping Bear Honey—who have been letting bees turn their apiary into gold for 40 years. But just like Stormcloud, Iron Fish and the others, St. Ambrose Cellars has taken on a life of its own, now offering local wine, craft beer, braggots (a scary name for honey-made ales) live music and a food truck. Want a drink in Benzie? It’s bound to be the best and most memorable you’ve ever had. rocks landing food ~ view ~ people ~ rock solid. The Big M trail in Manistee winds 33 miles through forests, flats and climbs. You’ll pedal high above the Manistee River on the Manistee leg of the North Country Trail. Roll across an 8-mile loop with hilly terrain at Arcadia Dunes. Bonus: the trailhead is next to Lake Michigan—perfect for an après ride dip. Crystal Mountain offers miles of on-site beginner, intermediate and advanced trails that connect to the 8-mile Betsie River Pathway. And don’t miss the Lake Ann Pathway—a 4-mile workout that dishes up four lakes and the Platte River. Make a reservation and spend a week in the authentically restored Keeperâ&#x20AC;&#x2122;s Quarters. Climb 34 steps to see the breathtaking view up and down Lake Michigan. The Third Order Fresnel Lens, that once shined 27 miles across the lake, is restored and on exhibit in the museum. Built in 1875, the Life Saving Station at Point Betsie Lighthouse was one of the earliest in the country. WHEN TRAVELING WITH YOUR PETS, REMEBER TO CARRY ALL MEDICAL & VACCINE RECORDS. Stretch your legs, Best Friend—you have plenty of room in this forest- and shoreline-filled region. Some great places for your biped to take you? The Platte River Campground and Esch and Peterson Road areas of the Sleeping Bear Dunes National Lakeshore; everywhere but swimming areas in Ludington State Park and the Nordhouse Dunes. Lake Michigan’s North Beach Access in Manistee, North Point Beach in Onekama and the Loomis Street Dog Beach in Ludington. Set on the shore of lovely Lake Ann, find an old-fashioned grocery store, the rocking Lake Ann Brewing Co. and a downtown beach. Crystal Mountain resort, the hub of this rural township, is a top destination for snowsports and plenty of fun in the summer too. Off campus, Geno’s Sports Bar & Grill is a destination all its own. Find a quintessential Up North vibe and a charming downtown shopping district. Summer evening Music in the Park concerts on Crystal Lake are idyllic. Brake on US31 for margaritas at the Roadhouse Mexican Bar & Grill. Benzonia also offers a first-rate historical museum and library, fabulous circa-1900 architecture and a house-made ice cream shop. A slow-mo small town on the shore of big ol’ Bear Lake offers superb fishing, an old-fashioned country store feeling at Wee Bee Jammin’ and organic berries (u-pick and we pick) at Ware Farm. Tucked between Lake Michigan and Arcadia Lake, this town is about water sports and beach days. But don’t miss the nationally renowned Arcadia Bluffs Golf Course. Just north on M22, find the highest viewing area on the Lake Michigan shoreline at Inspiration Point. With access to both Lake Michigan and Portage Lake, this charming hamlet is blessed with outdoor recreation-ops galore and a resort-y, laid-back downtown, where there are outdoor concerts Monday evenings June through August. This city, known for its wealth of lumber-era Victorian architecture, sits where the Manistee River flows into Lake Michigan. Find shops, restaurants, a Riverwalk and fabulous Lake Michigan beaches. Bonus: a long Lake Michigan pier for catching sunsets. This coastal town is outfitted with a top-flight microbrewery, a state-of-theart small-town theater, memorable eateries, fun shops, a big sandy swath of Lake Michigan beach and a lighthouse pier for sunset walks. Wedged next to Lake Michigan to the west and Pere Marquette Lake to the south, water sets the rhythm of life in this coastal city. Après water activities: concerts in the park, the Victorian-era shopping district, two historic lighthouses and a groovy food and craft beer scene. Perched between peaceful Betsie Bay and a stunning Lake Michigan bluff, Elberta dishes up one of the region’s most sensational in-town beaches, plus a handful of eclectic shops and eateries. With lakes Mitchell and Cadillac lapping at its perimeter, Cadillac is buffedup with new features including a children’s splash pad and a renovated performing arts pavilion. The Victorian-era downtown is home to boutiques, gift shops, eateries and trails. Tucked up next to Sleeping Bear Dunes National Lakeshore, this village is bordered by the Platte River and home to classic Northwood taverns, quiet campgrounds and mom ’n’ pop lodging. Where Should We Stay? This is a region of simple, spanking-clean mom ’n’ pop resorts on rivers, inland lakes and Lake Michigan. Places where you can kick your shoes off, let your hair down and really get the feel of this land. Sprinkled in the downtowns you’ll also find elegant (but relaxed) Victorian-era bed and breakfasts and inns. And if you’re looking for four-season luxe (spa and all) look no further than Crystal Mountain. vintage BENZIE Put the kids in their jammies and head to the circa 1953 Cherry BowlÂ Drive-in Theater. At the A & W in Frankfort your server will walk (not roll up on skates), but the old-style drive-up is authentic in every other detail. Dine on a cherry-influenced menu under the sign that carries the beaming pie face of Cherry Jerry at the Cherry Hut, a restaurant that began its life as a fresh cherry stand in 1922. In this region, where life ambles rather than races, these throwback treasures live on. Happy sigh.